Murania Press » Birthday Boy: Hiram S. Brown, Jr.
Birthday Boy: Hiram S. Brown, Jr.
Born on this day in 1909: Hiram S. Brown, Jr., whose career as a motion-picture producer lasted less than two years but gave us some of the finest serials made and released by Republic Pictures. Personally, I think he’s an unsung hero of serial history. A graduate of Princeton and Harvard Business School, “Bunny” (as he was known to friends) was the son of a former head of RKO. That probably helped him get a job at Republic, where he initially worked as a purchasing agent. 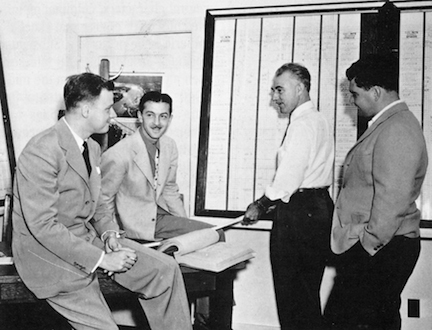 In 1939 he was made producer of the studio’s serial unit, whose staff directors were William Witney and John English. Together they turned out eight classic chapter plays. They are, in chronological order, Zorro’s Fighting Legion, Drums of Fu Manchu, Adventures of Red Ryder, King of the Royal Mounted, Mysterious Doctor Satan, Adventures of Captain marvel, Jungle Girl, and King of the Texas Rangers. In my opinion, Bunny has never gotten as much credit as he deserved for the unusually fine quality of these episodic thrillers. He pushed the writers to devise novel situations and inventive chapter endings whenever possible. He fought to use as villains such prominent A-list character actors as Henry Brandon and Eduardo Cianelli, even though they cost Republic more than the usual serial and B-picture heavies. He supported Witney and English when they asked for additional time and resources. He did battle with the front office to add another two weeks to the schedule of Drums of Fu Manchu, allotting the extra time to cinematographer William Nobles for eerie lighting effects on interior scenes. After making his first serial he eschewed use of the hated “recap chapters” (which included flashbacks to earlier episodes) to save money; instead he found other ways to economize. As World War II approached, Bunny left Republic to take a commission in the U.S. Signal Corps. He served with distinction but did not return to producing after the war’s end. But the eight serials he produced for Witney and English are still regarded highly by aficionados of the highly specialized form, and deservedly so. L to R: “Bunny,” Jack English, Louis Germonprez, Bill Witney.